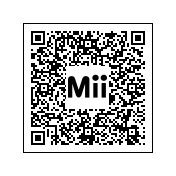 For fighter info, see Inkling (SSBU). "squid" redirects here. For for the pop idols , see Squid Sisters. Official artwork of an Inkling from Splatoon. 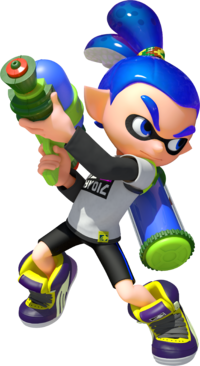 Inkling (インクリング, Inkling) is the species of player characters from the Splatoon universe. A green team Inkling in squid form in Splatoon. Inklings are creatures that can transform between a squid form and a humanoid form, which act as the players' avatars in Splatoon and Splatoon 2 (the latter of which also allows players to choose Octolings if they have purchased and completed the Octo Expansion DLC). Turf War battles between teams of Inklings involve using a variety of weapons to cover the map with their team's colored ink - which they can swim in while in squid form - while disrupting the other team's attempt to do the same within the time limit of three minutes. Inklings are also very fashionable, as they can be seen wearing different outfits as well as sporting different hairstyles (though hairstyle options are only available in Splatoon 2). Inklings are also colored based on ink battle teams from classic Splatoon. The Inkling Outfit/Wig being orange for female Mii Gunners and blue for male Mii Gunners is a reference to the two most prominent Inklings in promotional art (including Splatoon's cover), an orange female Inkling and a blue male Inkling. These two designs are also the basis of the original Inkling Boy and Inkling Girl amiibo designs. The pose used for the Inkling trophy in SSB4 also matches the Inkling Girl amiibo. The Inkling Squid Hat, resembling an Inkling's squid form, appears to reference the design used for the original Inkling Squid amiibo, which is also green and in squid form. As stated before, Inklings can transform into a squid showing off their ink color during certain scenarios. In Ultimate, some of the Inklings' moveset and actions allow them to change into their squid form, including their dash, grab, and Super Jump. Squids most often use their squid legs to produce ink, as using Super Jump inks opponents. Inklings value their ink so much because they dissolve in water, a trait that is also carried over into Ultimate. if Kirby swallows inkling, he'll gain inkling ink, but in the color of the classical girl variant of inkling. The Inkling Outfit and wigs in Super Smash Bros. for Wii U.
Inklings are the basis for two paid downloadable content costumes: the Inkling Outfit for Mii Gunners (with matching Inkling Wig headgear), and a standalone piece of headgear, the Inkling Squid Hat. 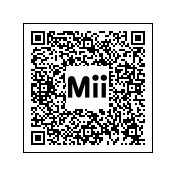 Two QR codes were also released for those who wish to have the exact Miis used in the costume's advertising, one for the male and one for the female Inkling. These outfits could be obtained for free with copies of Splatoon purchased from GameStop in North America before June 13th, 2015. Otherwise, they were made purchasable on the eShop on June 14th, 2015. The Inkling trophy is automatically unlocked after purchasing the Inkling Outfit. The Inkling trophy in Super Smash Bros. for Nintendo 3DS. The Inkling trophy in Super Smash Bros. for Wii U. Meet the Inklings, a mysterious race of beings that can transform into squid at will! They like to octopi their time with frantic, multicolored turf wars, and they won’t miss out on any oppor-tuna-ty to get to the top. And we wouldn’t go so far as to call them cod’s gift to fashion, but check out that fresh style! Meet the Inklings, a mysterious race of squid that can take a humanoid form at will. They like to octopi their time with frantic, multi-colored(sic) turf wars between rivals, and they won't miss out on any oppor-tuna-ty to get to the top! And we wouldn't go so far as to call them cod's gift to fashion, but check out that style! 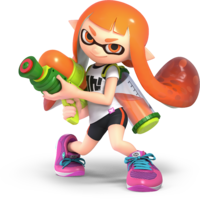 The female Inkling as she appears in Super Smash Bros. Ultimate. The Inklings, in female and male variations, are playable as unlockable newcomers in Super Smash Bros. Ultimate. The initial teaser trailer for Ultimate, before its title was revealed, featured the default female and male Inklings in their designs from the original Splatoon, though they were not explicitly confirmed to be playable until Nintendo's E3 2018 presentation. Splatoon 2 set for Mii Gunner. In addition to the returning Splatoon costumes from Smash 4, new costumes for the Mii Gunner based on the Inklings' appearances in Splatoon 2 are introduced. The Inkling Squid Hat headgear. The male Inkling as he appears in Super Smash Bros. Ultimate. 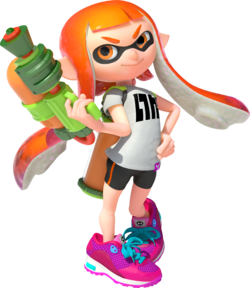 The skin color for the Inkling costume in Super Smash Bros. 4 changes to match the skin color used by the Mii wearing it, mirroring the ability to customize the playable Inkling's skin color in Splatoon. Oddly, the European version of Super Smash Bros. 4 doesn't change the spelling in the Inkling trophy from 'colored' to 'coloured'. Inkling and Wii Fit Trainer are the only characters with male and female alternate costumes where the female costume is the default image for the fighter. Inkling is the only character to have male and female alternate costumes where both genders have the same voice actor. Inkling, Dark Samus, Wii Fit Trainer, and Bayonetta are the only characters to have never appeared on a handheld console outside of Smash, though if the Nintendo Switch is counted as a handheld, then Inkling and Bayonetta do not have this distinction. Inkling is the only playable fighter in the Super Smash Bros. series whose console of origin is the Wii U, unless Alph as Olimar's alternate costume is counted. As with Pokémon Trainer, Robin and Corrin, the male and female variants of the Inklings have been established as separate entities, being unspecified members of a larger species and appearing together in cinematics that promote Ultimate. This page was last edited on April 16, 2019, at 16:32.